Bench grinders power tools used for shaping and sharpening metal. Depending upon the size and model of the bench grinder, you can purchase a variety of attachments including grinding wheels with multiple grits, wire wheels, cutting wheels and polishing wheels. Remove the outer guard by unscrewing the retaining screws. Use the hex wrench to loosen the tool rest, then pull the tool rest out beyond the grinding wheel. Use the adjustable wrench to remove the nut holding the grinding wheel in place. If you need to hold the opposite disk to prevent the axle from spinning, wear work gloves. Remove the washer and pull the wheel from the axle. Place the new wheel on the axle and return the washer to its original position. Return the nut to the axle and tighten it to the torque specified in your bench grinder manual. Return the tool rest to the operational position and tighten the hex bolt. Return the outer guard to the frame and tighten the screws. Check your manual to find the proper ratings, torque settings, and tools required for maintenance. These can vary from model to model and manufacturer to manufacturer. Always wear safety glasses when using a bench grinder. Never exceed the recommended torque when tightening the bolt securing the wheel. Doing so may result in damage to the wheel which could cause the wheel to come apart during normal operation. 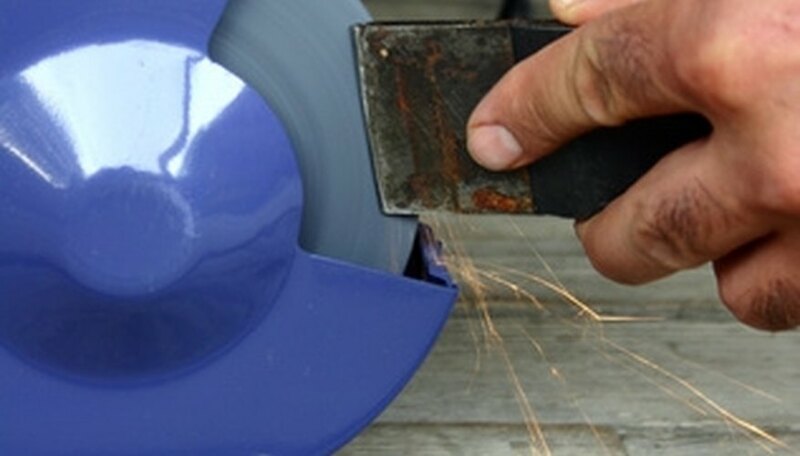 Always make sure that the replacement wheel is the proper size and speed rating for your bench grinder.